Archaeologists excavating in Mexico City have discovered a platform in the Templo Mayor ruins, believed to be used for ceremonial purposes at the Aztec capital of Tenochtitlan. The platform, covered in ornate stone carvings consists of 19 serpent heads, each half a metre in length. Excavated over a 9 month period, the platform is roughly 15 metres in length and dates from A.D. 1469. In 1997, archaeologists using a geophysical technique known as ground-penetrating radar (GPR) found evidence to suggest underground chambers close to where the platform discovery was made. The Templo Mayor was the heart of a complex consisting of two temples, five platforms and subsidiary buildings from the pre-Hispanic Aztec Empire. Its architectural style belongs to the late Post classical period of Mesoamerica. The temple was called the huey teocalli in the Nahuatl language and dedicated simultaneously to two gods, Huitzilopochtli, god of war and Tlaloc, god of rain and agriculture, each of which had a shrine at the top of the pyramid with separate staircases. 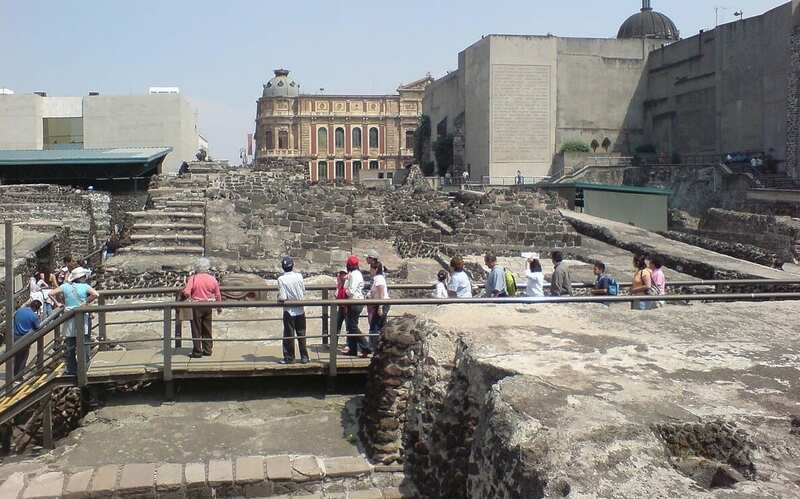 After the destruction of Tenochtitlan, the Templo Mayor, like most of the rest of the city, was taken apart and then covered over by the new Spanish colonial city. The Temple’s exact location was forgotten, although by the 20th century scholars had a good idea where to look for it. This was based on the archeological work done at the end of the 19th century and the first half of the 20th. Leopoldo Batres did some excavation work at the end of the 19th century under the Mexico City Metropolitan Cathedral because at this time, the temple was thought to be there. In the first decades of the 20th century, Manuel Gamio found part of the southwest corner of the temple and his finds were put on public display. However, it did not generate great public interest in excavating further as the zone was an upper-class residential area. In 1933, Emilio Cuevas found part of a staircase and beam. In 1948, Hugo Moedano and Elma Estrada Balmori excavated a platform containing serpent heads and offerings. In 1966, Eduardo Contreras and Jorge Angula excavated a chest containing offerings that was first explored by Gamio. However, the push to fully excavate the site did not come until late in the 20th century. On 25 February 1978, workers for the electric company were digging at a place in the city then popularly known as the “island of the dogs.” It was named such because it was slightly elevated over the rest of the neighborhood and when there was flooding, street dogs would congregate there. At just over two meters down they struck a pre-Hispanic monolith. This stone turned out to be a huge disk of over 3.25 meters (10.6 feet) in diameter, 30 centimeters (11.8 inches) thick and weighing 8.5 tons. The relief on the stone was later determined to be Coyolxauhqui, the moon goddess, dating to the end of the 15th century. To excavate, thirteen buildings in this area had to be demolished. Nine of these were built in the 1930s and four dated from the 19th century, and had preserved colonial elements. During excavations, more than 7,000 objects were found, mostly offerings including effigies, clay pots in the image of Tlaloc, skeletons of turtles, frogs, crocodiles, and fish, snail shells, coral, some gold, alabaster, Mixtec figurines, ceramic urns from Veracruz, masks from what is now Guerrero state, copper rattles, decorated skulls and knives of obsidian and flint. These objects are housed in the Templo Mayor Museum. This museum is the result of the work done since the early 1980s to rescue, preserve and research the Templo Mayor, its Sacred Precinct and all objects associated with it. The museum exists to make all of the finds available to the public. Mexican pyramids were typically expanded by building over prior ones, using the bulk of the former as a base for the latter, as later rulers sought to expand the temple to reflect the growing greatness of the city of Tenochtitlan. Therefore, digging down through this pyramid brings us back in time. The first temple was begun by the Aztecs the year after they founded the city, and the pyramid was rebuilt six times after that. All seven stages of the Templo Mayor, except the first, have been excavated and assigned to the reigns of the emperors who were responsible for them. Construction of the first Templo Mayor began sometime after 1325. This first pyramid is only known through historical records as the high water table of old lakebed prevents excavation. According to these records, the first pyramid was built with earth and perishable wood, which may not have survived to the present time.The second temple was built during the reigns of Acamapichtli, Huitzilihuitl and Chimalpopoca between 1375 and 1427. The upper part of this temple has been excavated, exposing two stone shrines covered in stucco on the north side. A chacmool was uncovered as well. On the south side there is a sacrificial stone called a “téchcatl”and a sculpted face.The third temple was built between 1427 and 1440 during the reign of Itzcoatl. A staircase with eight stone standard-bearers is from this stage bearing the glyph with the year Four-Reed (1431) These standard bearers act as “divine warriors” guarding the access to the upper shrines. The fifth temple (1481–1486) is dated during the short reign of Tizoc. During these five years the platform was recovered in stucco and the ceremonial plaza was paved. The sixth temple was built during the reign of Ahuizotl. The Sacred Precinct was walled off and this wall was decorated with serpent heads. He built three shrines and the House of the Eagle Warriors. At the inauguration of this Great Temple in 1487, Ahuizotl ordered the sacrifice of many prisoners of war; an average of 1,000 victims a day were sacrificed over a period of twenty days. Each day blood ran like a river onto the pavement of the Great Plaza, and the stairs of the great pyramid were literally bathed in blood. The seventh and last temple is what Hernan Cortes and his men saw when they arrived to Tenochtitlan in 1519. Very little of this layer remains because of the destruction the Spaniards wrought when they conquered the city. Only a platform to the north and a section of paving in the courtyard on the south side can still be seen. Most of what is known about this temple is based on the historical record. It was at the time the largest and most important active ceremonial center. Fray Bernardino de Sahagun reports the Sacred Precinct as having 78 buildings; however, the Templo Mayor towered above all of them. The pyramid was composed of four sloped terraces with a passage between each level, topped by a great platform that measured approximately 80 x 100 meters. It had two stairways to access the two shrines on the top platform. One was dedicated to Tlaloc, the god of water on the left side (as you face the structure), and one to Huitzilopochtli, god of war, on the right side. The two temples were approximately 30 meters in height, and each had large braziers where the sacred fires continuously burned. The entrance of each temple had statues of robust and seated men which supported the standard-bearers and banners of handmade bark paper. Each stairway was defined by balustrades flanking the stairs terminating in menacing serpent heads at the base. These stairways were used only by the priests and sacrificial victims. The entire building was originally covered with stucco and polychrome paint. On 14 November 1521, Cortes seized the emperor Cuauhtémoc and ordered the destruction of all the religious relics of the Aztecs. He ordered a Catholic cross placed on the Templo Mayor. While Cortes left for Veracruz to confront Spaniards looking to arrest him, Pedro de Alvarado learned of a plan to attack the Spaniards, and staged a pre-emptive attack on the Aztecs in the Sacred Precinct while they celebrated a religious festival. Unarmed and trapped within the walls of the Sacred Precinct, an estimated 8,000–10,000 Aztec nobles were killed. When word of the massacre spread throughout the city, the people turned on the Spaniards, killing seven, wounding many, and driving the rest back to their quarters. The Spaniards were trapped between two Aztec forces and 68 were captured alive. Ten of these Spanish captives were immediately sacrificed at the Temple and their severed heads were thrown back to the Spaniards. The others were sacrificed at the Great Temple that night, which could be seen from the Spanish camps. The sacrificed Spaniards were flayed and their faces — with beards attached — were tanned and sent to allied towns, both to solicit assistance and to warn against betraying the alliance.